Simon & Schuster, 9781439189771, 336pp. 1967. Two rival football teams. Two legendary coaches. Two talented quarterbacks. Together they broke the color line, revolutionized college sports, and transformed the NFL. In September 1967, after three years of landmark civil rights laws and three months of devastating urban riots, the football season began at Louisiana’s Grambling College and Florida A&M. The teams were led by two extraordinary coaches, Eddie Robinson and Jake Gaither, and they featured the best quarterbacks ever at each school, James Harris and Ken Riley. Breaking the Line brings to life the historic saga of the battle for the 1967 black college championship, culminating in a riveting, excruciatingly close contest. Samuel G. Freedman traces the rise of these four leaders and their teammates as they storm through the season. Together they helped compel the segre­gated colleges of the South to integrate their teams and redefined who could play quarterback in the NFL, who could be a head coach, and who could run a franchise as general manager. In Breaking the Line, Freedman brilliantly tells this suspenseful story of character and talent as he takes us from locker room to state capitol, from embattled campus to packed stadium. He captures a pivotal time in American sport and society, filling a missing and crucial chapter in the movement for civil rights. Samuel G. Freedman is a columnist for The New York Times and a professor at the Columbia University Graduate School of Journalism. He is the author of six acclaimed books, four of which have been New York Times Notable Books of the Year. Freedman also has written frequently for USA TODAY, New York magazine, Rolling Stone, The Jerusalem Post, Tablet, The Forward, and Salon.com. He lives in Manhattan with his fiance and his children. "Call it the year's boldest subtitle. . . . But by tracing the fortunes of Florida A&M and Grambling, Samuel G. Freedman's Breaking the Line succeeds in making a compelling argument that the 1967 season was indeed that significant. It's an instructive book, which is not to say it's not entertaining too. It is." 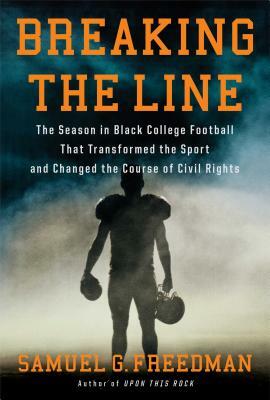 "Breaking the Line is the story of the competition for the 1967 black college championship, told through the lives of the coaches and quarterbacks who endured prejudice at every turn, all while paving the way for integration of the sport of football at all levels. There is plenty of inspiring politics here, but the real pleasure is in the X’s and O’s: Freedman describes games with the proper mixture of glory and suspense that football can generate even when it’s not being used as a catalyst for social change." "In a book full of smooth prose and jaunty narrative, author Samuel G. Freedman evokes two of the biggest legends of jazz and big bands to compare two iconic powers of black college football — and their coaches. ... Freedman has written more than a sports book. It is a valuable and necessary work of social history."